With Tanner Foust taking a sabbatical from drifting this year Papadakis Racing was left with an empty seat and empty title sponsor slot. 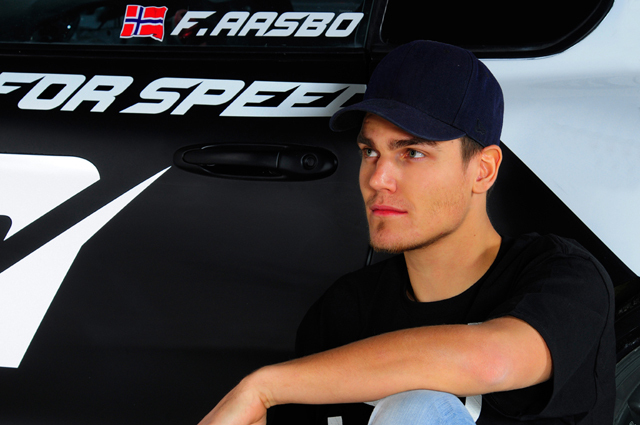 In a major move Team Need For Speed has joined forces with Papadakis racing to bring the sponsor dollars and the new power team has signed Fredric Aasbo to drive for them. Aasbo was Formula Drift “Rookie Of The Year’ in 2010 and earned it rightfully so. In his first time out at Long Beach last year he made it to the tandem round and took out the reigning champ Chris Forsberg! From that point on he continued to impress by trading paint with Vaughn Gittin Jr in a few epic battles. With Rockstar Energy Drink going with Tanner Foust the livery of the 2011 Scion Racing tC needed a few “adjustments” check out the pictures below for a rendering of the new livery and a quick snap shot of where they are at with the progress of the build so far. You can also get more info in the press release as well. BALTIMORE, Md. (February 8, 2011) — Need for Speed and Papadakis Racing have partnered up for the 2011 Formula Drift season and have brought on board the 2010 Rookie of of the Year and Nordic Drift Champion, Fredric Aasbo, to drive the Need for Speed 2011 Scion tC. 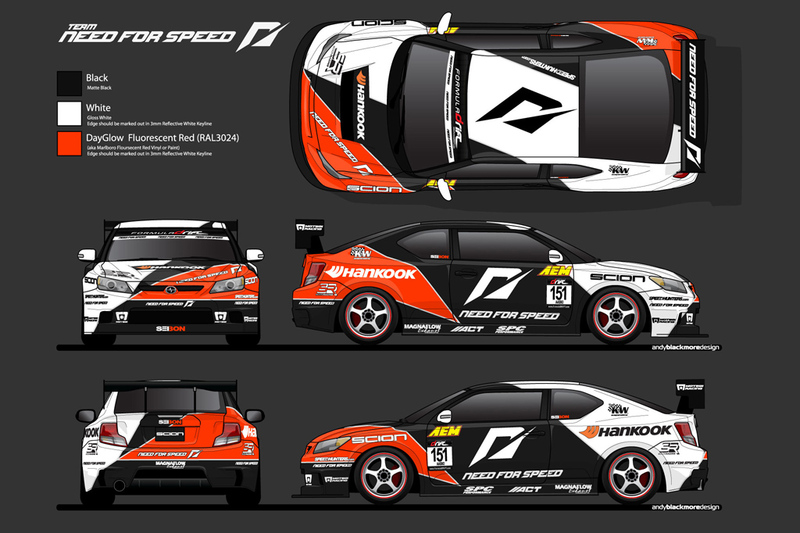 With the Formula Drift season opener right around the corner in Long Beach, California on April 8-9, the Need for Speed Scion tC will be there to make its competition debut with Fredric Aasbo in the driver’s seat. For more information on Team NFS visit TeamNeedforSpeed.com, become a fan at Facebook.com/NeedForSpeed, or follow NFS on Twitter @NeedforSpeed. Team Need for Speed consists of an all-star roster of drivers renowned for their skill on the track and passion for the automotive lifestyle. With over 100 million units sold, Need for Speed is the best-selling racing game franchise in the world and is known for delivering unparalleled white-knuckle racing, creative customization and street style. The sequel to the critically acclaimed Need for Speed SHIFT returns to the track to deliver the most physical racing experience to date with SHIFT 2 Unleashed available March 29, 2011. SHIFT 2 Unleashed sets the bar for realistic racing and delivers all the excitement and intensity of race day in a groundbreaking true-to-life experience. For more information about Team NFS, visit TeamNeedforSpeed.com. Team owner Stephan Papadakis is a legend of sport-compact racing who began building his reputation in the 1990s with the first front-wheel-drive, tube-chassis drag car in the U.S. The team earned multiple records and championships in the discipline, turning in elapsed times and trap speeds previously thought unattainable in front-drive drag cars. The team began drifting in 2005, and invited Tanner Foust to join them a year later. Papadakis Racing has shown impressive results in five years of Formula DRIFT competition, earning two championship titles (2007, 2008) and one runner up (2010). Entering its eighth season, Formula DRIFT is recognized as the North American professional drifting championship. Established on the streets of Japan, drifting has evolved into a worldwide competitive sport that challenges each driver’s driving ability and vehicle control. Formula DRIFT provides a forum for professional drifters to compete in 7 events nationwide for the coveted Formula DRIFT Championship crown. As the first official series in North America, Formula DRIFT has taken competitive motorsports to the extreme, attracting fans and car enthusiasts from all walks of life and establishes itself as the world-wide leader for the Sport. For a competition schedule and ticket information, visit FormulaDrift.com.